Copyright: 2017 Gautam G, et al. This is an open access article distributed under the Creative Commons Attribution License, which permits unrestricted use, distribution, and reproduction in any medium, provided the original work is properly cited. Background & Objectives: Fluoride releasing bonding agents can help the orthodontist to minimize enamel demineralization independent of patient cooperation. This in vivo study was conducted to evaluate the efficacy of resin modified glass ionomer cement (RMGIC) on reducing enamel demineralization around orthodontic brackets and confirm the superior caries-preventive effect of RMGIC by assessing the mutans streptococci (S. mutans) in plaque samples in vitro. Methods: 60 subjects (aged 14-20 years) scheduled to have premolar extractions as part of the orthodontic treatment plan were selected and randomly divided into 2 groups of 30 each (group 1: the brackets were bonded on the teeth using light cure composite resin and group 2: the brackets were bonded using RMGIC). Plaque scores (modification of plaque index by Silness and Loe) were recorded and plaque samples were collected before bonding, one week and one month after bonding. S.mutans colonies were recorded from the plaque samples inoculated on MSB agar plates, incubated under 95% N2 and 5% CO2 for 48 hours at 370C in a CO2 jar. After 1 month, the right maxillary and mandibular first premolars were debonded, extracted and depth of enamel demineralization area was estimated using polarized light microscope. Results: After statistical analysis, a significantly higher mean depth of demineralized lesions was noticed in group 1 as compared to group 2. A significant difference between occlusal and gingival depth was seen only in group 2, thus illustrating a wedge effect. In group 1, a statistically significant increase in the mean colony forming units (CFU) of S.mutans has been noticed at different time intervals whereas in group2, a significant increase was observed only at 1month. Unlike at 1 month, a statistically significant difference in mean CFU between group 1 and group 2 has been observed at 1 week (P<0.05). Conclusions: Enamel lesions adjacent to the bracket base on teeth bonded with the RMGIC were smaller than those on teeth bonded with a composite resin. The high “burst effect” of fluoride release for the first few days of RMGIC after bonding is confirmed by statistically significant reduction in CFU counts of S. mutans in plaque. Enamel decalcification and white spot lesion (WSL) formation are major clinical problems for patients treated with fixed orthodontic appliances . Results of a meta-analysis by . demonstrated that WSL occurrence is common during fixed orthodontic treatment with an incidence and prevalence rate of 45.8% and 68.4%, respectively, indicating the need for special precautionary steps to be taken to prevent the development of WSLs [1,3], Attributed the WSL (clinically detectable areas of decalcification), considered to be the precursor of frank enamel caries, to prolonged accumulation and retention of bacterial plaque on the enamel surface adjacent to the orthodontic appliances . The insertion of fixed orthodontic appliances results in a number of new plaque retention sites . Favored sites for accumulation of plaque are around the cervical margins of the teeth, under the bands in areas where the cementing medium has washed out, on the resin surfaces adjacent to bonded attachments, and at the junction of the bonding resin and the etched enamel surfaces . These appliances physically alter the microbial environment with the increased proliferation of facultative bacterial population leading to a marked and localized direct etching of the tooth under the plaque after only one week and visible WSLs within one month adjacent to brackets . Dental plaque is an example of a biofilm; its presence is natural and it supports the host in its defense against invading microbes. Under certain circumstances, this microbial homeostasis can break down and diseases such as caries can occur. In dental caries, there is a shift toward increased proportions of acid-producing and acid-tolerating species, such as mutans streptococci and Lactobacilli, although other species with relevant traits can participate in demineralization [6,7]. Reported a rise in the number of S. mutans and lactobacilli (LB) after the placement of orthodontic appliances increasing the risk of occurrence of demineralization . Many studies have shown that fluoride in trace quantities can increase the degree and rate of remineralization by encouraging and accelerating the regrowth of depleted crystals.15 Fluoride also inhibits the bacterial activity of S. mutans. Fluoride ions interfere with the initial bacterial adhesion and colonization. The inhibitory effect of fluoride on bacterial acid production and their growth is enhanced by a decrease in pH of the fluoride solution . Fluorides releasing bonding agents have the potential to minimize demineralization around orthodontic brackets independent of patient cooperation . Resin modified glass ionomer cements (RMGIC) have been developed that combine the desirable properties of composite resin (bond strength) and glass ionomer (fluoride release and recharge) by modification or substitution of the liquid portion of the glass ionomer material . Inhibition of enamel demineralization is shown to occur in vitro to a distance of even 7 mm away from RMGIC restorations [3,10]. The reduction of lesion depth of RMGICs compared to non-fluoridated materials ranged from 35% to 75% [10,11]. The purpose of this study is to compare, in vivo, the effect of RMGIC and composite resin for bracket bonding on enamel demineralization adjacent to brackets and confirm with the levels of mutans streptococci [MS] (S.mutans) in plaque. After obtaining the institutional ethical approval, sixty subjects (14-20 years) scheduled to have premolar extractions as a part of the orthodontic treatment plan formulated at the Department of Orthodontics and Dentofacial Orthopedics, Government Dental College and Research Institute, Bangalore, satisfying all the inclusion and exclusion criterias were selected for the study. A written informed consent in their respective mother tongue was obtained from the subjects. 1. Subjects with normal salivary flow rate (>1.0 ml/min). 2. Subjects with normal salivary buffer capacity (final pH between 6.0 and 7.0). 3. Right handed subjects (subjects who use their right hand for brushing teeth). 4. Subjects with plaque scores between 0.1 and 0.9 according to the modification of plaque index by Silness and Loe. 1. Subjects with active carious lesions. 2. Subjects with first premolar teeth showing signs of enamel hypoplasia or cracks. 3. Subjects having any chronic disease. 4. Subjects who have received any antibiotics in the previous six weeks. The subjects were randomly divided into two groups of 30 each using sealed envelope system by an individual not involved in the study. Group 2: brackets were bonded on the teeth using RMGIC (Fuji Ortho LC, GC Corp, Tokyo, Japan). With a cheek retractor in position, the buccal enamel was pumiced, washed and dried. A piece of masking tape with a cut-out of the size of a bracket base was applied on the right upper and lower first premolars. This was done to ensure that there was no etching of the adjacent enamel, which could prematurely initiate demineralization. For subjects in group 1, brackets were bonded on the teeth with light cure composite resin, Transbond XT (3M Unitek). The enamel was conditioned with 37% phosphoric acid (OrthoSource) for 30 seconds. The brackets were positioned on the buccal surface at the height of contour mesiodistally, in the middle one third occlusogingivally and parallel to the long axis of the tooth and excess was removed with a scaler tip and was light cured for 40-60 seconds. For subjects in group 2, brackets were bonded on the teeth using RMGIC (Fuji Ortho LC, GC Corp., Tokyo, Japan). The enamel was conditioned with 10% polyacrylic acid (GC Dentin Conditioner) for 30 seconds. The surface was washed for 10 seconds and kept moist as moisture aids in the bonding reaction. Back of the bracket was coated with mixed Fuji Ortho LC. Care was taken not to create any bubbles or voids. The coated bracket was positioned on the tooth and the bracket was firmly pressed against enamel. Excess cement was removed with a scaler tip. Each bracket was light cured for 40-50 seconds. In both the groups 022΄΄ (0.56mm) MBTTM (3M Unitek) brackets were used for bonding. Brackets were bonded on all the teeth except the left upper and lower first premolars. Since glass ionomer cement has fluoride release potential, molar bands were cemented with zinc phosphate cement. Appliance setup was completed by placing lacebacks with 0.010” steel ligature wires from first molar to canine and 0.016” Nickel Titanium (NiTi) wire was secured in the bracket slots with conventional elastomeric ligatures (ALASTIK 3M unitek). The archwire was cinched back to prevent anchorage loss in the anterior region. Plaque scores (modification of plaque index by Silness and Loe) were recorded before bonding, one week and one month after bonding and plaque samples were collected from the right upper and lower first premolars using a sterile hypodermic needle (0.4 mm diameter) The end of the needle was aseptically cut off into a test tube containing 1ml of sterile phosphate buffer solution (pH 7.1). S.mutans were identified on the basis of colony morphology, after incubation of inoculated MSB agar plates under 95% N2 and 5% CO2 for 48 hours at 370C. The colony growth was either large rounded colonies having gum drop appearance or darker, small rounded pinpoint colonies. All these colonies were subjected to gram staining to confirm the identification as streptococci. Individual colony counts were used as total CFU per sample, transformed to log10 (colony count+1) to normalize the distribution. After 30 days, the brackets bonded on the right upper and lower first premolars were removed with a sterile debracketing instrument and the teeth were extracted with particular care to avoid damage to the buccal surface of the tooth. The extracted teeth were rinsed carefully with deionized water and stored at 100% relative humidity on wet cotton dampened with 2% formaldehyde in closed container at 400C until analysis. Each tooth was embedded in acrylic and longitudinal buccolingual sections of teeth were made in the middle of the crown with the help of hard tissue microtome (Leica SP 1600) to yield sections 100μm thick. The acrylic slice which now contains embedded tooth section was placed in acetone solution for around 30 minutes thus facilitating the separation of softened acrylic from the tooth section with the help of soft paint brush. After alcohol treatment for 30 minutes, tooth section was placed in a mixture of xylene and alcohol. With the help of a soft paint brush the remaining acrylic debris were cleaned up. In order to fix the tooth section, it was placed in xylene for one hour. The tooth section was mounted on the glass slide using Dibutyl Pthallate Xylene (DPX). The sections were evaluated with polarized light microscopy (Olympus VX 52). Microphotographs of the gingival half of the buccal surface were taken with fixed magnification of 20 times. The depth of demineralized lesions was measured using ProGres C3 2.5 image analysis software. The lesion depth in micrometers (µm) for each section was the average of 3 representative measurements (gingival, middle and occlusal) from enamel surface to the depth of the lesion. The student‘t’ test was used to determine whether there was a statistical difference between Groups in the parameters (plaque score, CFU counts of S.mutans and depth of lesion with enamel demineralization) measured and P value less than 0.05 was taken to be statistically significant. The data was analyzed using Statistical Package for Social Science (SPSS, version 13). A statistically significant (P<0.001) increase in mean plaque score was observed within both the groups from baseline (0.49 for group 1 and 0.47 for group 2) to one week (0.60 for group 1 and 0.55 for group 2) and 1 month (1.18 for group 1 and 1.10 for group 2). However, there was no significant difference between the groups at different time intervals (P>0.05) (Tables 1,2). A statistically significant (P<0.001), higher mean depth of demineralized lesions was noticed in group 1 (55.65 µm) as compared to group 2 (24.39 µm) (Table 3, Graph 1). A statistically significant difference was observed in mean depth of occlusal, middle and gingival region of demineralized areas in group 1 and group 2 (Table 4, Graph 2). A significant difference between occlusal and gingival depth is seen in group 2 unlike in group 1 (Table 5, Graph 3). A statistically significant increase was noticed in the mean CFU at different time intervals in group 1 from baseline (2.30) to 1 week (3.07) and 1 month (4.82). However in group 2, the increase in mean CFU at 1 week (2.54) as compared to that at baseline (2.45) was not found to be statistically significant (P>0.05). A statistically significant increase was observed at 1 month (4.44) (Table 6, Graph 4). 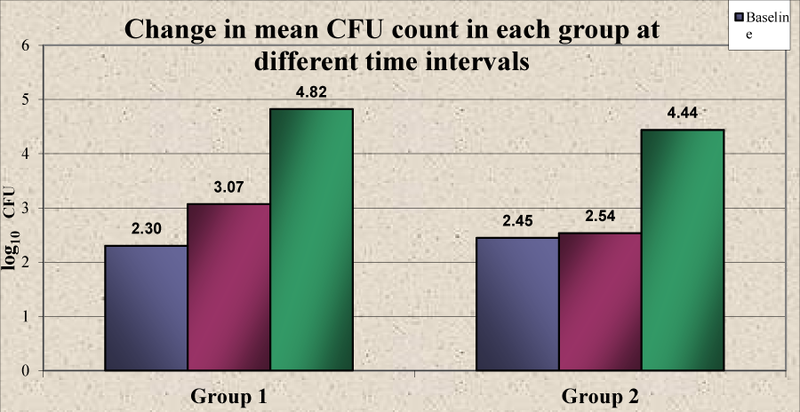 There was no significant difference in the mean CFU between group 1 and group 2 at baseline (P>0.05). There was a higher mean CFU in group1 compared to group 2 at 1 week and 1 month but a statistically significant difference was observed only at 1 week (P<0.05) (Table 7, Graph 5). Fixed appliances are an inseparable part of contemporary orthodontic treatment but a major disadvantage of fixed mechanotherapy is that measurable and significant amount of enamel demineralization might occur adjacent to orthodontic bracket even within one month of bonding. This demineralization is a result of plaque activity in vivo . Fixed appliances physically alter the oral microbial environment so that the proliferation of caries-associated microorganisms, such as S. mutans and LB, is enhanced . As per  while examining the effectiveness of a fluoride product in preventing dental decay, two aspects should be considered. Firstly, whether the fluoride product reduces the number of white spots appearing during treatment and secondly whether it reduces the severity in terms of the size or area of the tooth surface affected or the amount of mineral lost or depth of the decay. When a quantitative method of measuring the amount of mineral lost from enamel or the depth of a carious lesion is used, such as transverse microradiography, polarized microscopy or hardness testing, the tooth being examined has to be extracted and cut into sections. Short experimental periods are inevitable, as delaying the extraction of the tooth will also delay the orthodontic treatment . Significantly higher mean depth of demineralized areas noticed in group 1 as compared to group 2 is in accordance with the findings of [2,7,11,13], who emphasized that teeth bonded with the hybrid GIC demonstrated significantly smaller enamel lesions adjacent to the bracket base than teeth bonded with a composite resin. Similar findings were also reported by [4,14,15], Using two parallel groups and assessing enamel demineralization by cross sectional microhardness testing . Reported that Fuji Ortho LC reduced enamel demineralization adjacent the brackets by 12% as compared to composite resin (Concise) even though the microhardness of enamel under the brackets bonded with Fuji Ortho LC or Concise was similar, showing that the demineralization was due to caries and not the acid-etching effect of the material . In this study teeth bonded with RMGIC had an approximately 50% reduction in lesion depth compared with those bonded with composite resin, in accordance with the findings of [2,13]. A significantly higher mean gingival meauserments (farther from the cement) compared to occlusal measurements (closer to the cement) in group 2 substantiates the wedge effect seen in teeth bonded with RMGIC. Similar wedge effect of RMGIC was also reported by [2,13]. The wedge effect could be due to greater dental plaque accumulation in the gingival/ cervical region of the tooth and the difficulty in cleaning this area. Protective effect of the fluoride released from the RMGIC also decreased outward from the edge of the bracket. A significant difference in the mean plaque score at different time intervals in both the groups was observed, indicating that the placement of fixed appliances influences the accumulation of plaque . Found that clinical parameters like plaque index, gingival index and bleeding on probing scores had increased significantly three months after orthodontic treatment began . The authors did not find any significant difference in the amount of plaque accumulation with the two materials at different time intervals as reported by [7,8]. S. mutans has been strongly associated with caries development in humans . S. mutans is also found on sound tooth surfaces, and its presence does not always indicate the presence of active caries. However, an increased number of these microorganisms on any surface indicate that the disease may be present or may develop in the near future [18,19]. Reported variation in culture results on different medias used for the isolation of S. mutans with the greatest recovery in MSB 10% sucrose medium . A significant increase in the mean CFU at different time intervals noticed except between baseline and 1 week in group 2 confirms that the placement of fixed appliances increases the level of S. mutans in plaque and saliva. This finds support with studies of [5,15,18,20]. In group 2 the mean CFU difference between baseline and 1 week was not statistically significant unlike group 1, a possible reason being the initial burst of fluoride release by Fuji Ortho LC as displayed by [8,21]. This further confirms the overall results of the systematic review by , which showed either no difference between the materials, or indicated that RM-GIC has a superior caries-preventive effect [12,22]. Evaluated the antibacterial properties of 4 different orthodontic cements, using both the agar diffusion test and the direct contact test (DCT) and concluded that RMGIC (Fuji Ortho LC) exhibited potent antibacterial activity, which lasted one week and diminished over the next three weeks [12,23]. Showed a good correlation between fluoride release and influence on bacterial growth for RMGIC. However, both effects dropped dramatically over the 180-days period thus confirming the initial burst of fluoride release from RMGIC at the time of bonding . On the contrary , on the basis of their in vitro study suggested that the amount of fluoride released from GIC per se may have little to do with bacterial growth inhibition instead the bacterial inhibitory effect is related to the acid released from the cement as the reduction in GIC pH and the size of bacterial growth inhibition areas were consistently associated. Their study, however, could not rule out the possibility that the antimicrobial activity of GIC could be related both to the initial acid release and fluoride levels of the cement samples, since bacterial inhibitory effect of fluoride increases as pH decreases [24,25]. In the in vitro study reported that the orthodontic bonding adhesive may release fluoride at a rate that affects enamel demineralization rather than bacterial adhesion. Low levels of fluoride may be enough to protect enamel against demineralization but may have little effect on inhibiting growth and adhesion of the cariogenic streptococci . Apart from fluoride release, other advantages of RMGIC when compared to composite resins for bonding orthodontic brackets as emphasized by , like significant reduction of chair time, eliminating the need for working in a dry field and eliminating the need for etching and priming enamel surfaces were also observed during the present study . 1. Teeth bonded with the RMGIC demonstrated significantly smaller enamel lesions adjacent to the bracket base than teeth bonded with a composite resin control. 2. In teeth bonded with RMGI cement, depth of enamel lesion increased as the lesion extended farther from the bracket (towards the gingival region of the tooth), illustrating a wedge effect—a decreasing protective effect of the fluoride released from the RMGIC in the enamel increasingly distant from the bracket. 3. A significant increase in the number of MS (S. mutans) CFU in plaque was observed within one month after the placement of fixed orthodontic appliances in both the groups. 4. There was a reduction in the CFU counts of S. mutans in plaque around brackets bonded with RMGIC compared with composite resin and this reduction was statistically significant at 1 week, emphasizing the high “burst effect” of fluoride release for the first few days of RMGIC after bonding. Hammersfahr P. Developments in resionomer systems in glass-ionomers. In: Hunt PR, editor. Glass ionomers: the next generation. Proceedings of the 2nd International Symposium on Glass-Ionomers. Philadelphia, PA: International Symposia in Dentistry. 1994; 47-55. Newbrun E. Cariology 3rd ed. Quintessence Publishing Co. Inc, Chicago, Illinois. 1989; 13-61. Brantley AW, Eliades T. editors: Orthodontic materials- scientific and clinical aspects, Stuttgart, Germany. 2001.